Plant fatty acid α-dioxygenases (α-DOX) are oxylipin-forming enzymes induced by biotic and abiotic stresses, which also participate in developmental processes. In Nicotiana attenuata, herbivory strongly induces the expression of an α-dox1 gene. To determine its role, we silenced its expression using Agrobacterium-mediated plant transformation with an inverted repeat construct. More than half of the transformed lines showed a severe dwarf growth phenotype that was very similar to the phenotype of tomato plants mutated at a second α-dox isoform. This led us to identify the corresponding α-dox2 gene in N. attenuata and examine the regulation of both α-dox genes as well as the consequences of their silencing in plant development and anti-herbivore defense. The transformed lines exhibiting a dwarf growth phenotype are co-silenced for both α-dox genes resulting in a nearly complete suppression of α-DOX activity, which is associated with increases in ABA, JA and anthocyanin levels, all metabolic signatures of oxidative stress. The other lines, only silenced for α-dox1, developed similarly to wild-type plants, exhibited a 40% reduction of α-DOX activity resulting in a 50% reduction of its main product in planta (2-HOT) and showed no signs of oxidative stress. In contrast to α-dox1, the expression of α-dox2 gene is not induced by wounding or elicitors in the oral secretions of Manduca sexta. Instead, α-dox2 is expressed in roots and flowers which lack α-dox1 expression, but both genes are equally regulated during leaf maturation. We transiently silenced α-dox gene copies with gene-specific constructs using virus induced gene silencing and determined the consequences for plant development and phytohormone and 2-HOT levels. While individual silencing of α-dox1 or α-dox2 had no effects on plant growth, the co-suppression of both α-dox genes decreased plant growth. Plants transiently silenced for both α-dox genes had increased constitutive levels of JA and ABA but silencing α-dox1 alone resulted in lower M. sexta-induced levels of JA, 2-HOT and ABA. Thus, both α-dox isoforms function in the development of N. attenuata. In leaf maturation, the two α-dox genes have overlapping functions, but only α-dox2 is involved in root and flower development and only α-dox1 functions in anti-herbivore defense. Fatty acid (FA) hydroperoxides are intermediates in different oxylipin pathways controlling plant development  and plant responses to stresses . To date, much of the research on oxylipin signals has focused on jasmonic acid (JA) whose biosynthesis starts with the peroxidation of linolenic acid (C18:3) mediated by 13-lipoxygenase (13-LOX) enzymes. In Nicotiana attenuata, silencing of lox3, a gene coding for a 13-LOX isoform, considerably reduces the accumulation of herbivory-induced jasmonic acid and as a consequence, the accumulation of several direct defense compounds, such as nicotine and trypsin proteinase inhibitors, as well as terpenoid volatiles that function as indirect defenses . Consistent with its important regulatory role in mediating responses to herbivory, lox3 expression increases after herbivore attack . In N. attenuata, one of the transcripts most strongly elicited by the feeding of different herbivores is an α-dioxygenase (α-dox), a gene homologue of Nicotiana tabacum (Nt) α-dox [5–8]. The Ntα-dox was first identified as a pathogen inducible oxygenase (PIOX) sharing significant homologies with mammalian prostaglandin endoperoxidases . α-DOXs are FA-hydroperoxidases which target the α-carbon (C2) of a broad range of FAs [9, 10]. In vitro, their catalytic activity is characterized by the production of long-chain aldehydes formed from α-hydroperoxy-FA molecules that escape reduction to α-hydroxy-FA and undergo spontaneous decarboxylation . Like LOXs, α-DOXs also use linolenic acid (C18:3) as substrate, but convert it to heptadecatrienal (HDT) in vitro. However, quantification of the oxidative products of α-DOX activity in response to bacterial inoculation, revealed that 2-hydroxy-C18:3 (2-HOT) is the major product synthesized in tobacco plants . Because 2-HOT exhibits antimicrobial activity at high concentrations, it may directly protect plants against pathogen attack [11, 12]. However, the biological functions of this and other α-DOX products remain largely unknown. Several lines of evidence indicate that α-dox genes are involved in responses to different abiotic and biotic stresses. In tomato roots, for example, ethylene increases α-dox transcript accumulation during salt stress . Other abiotic stresses, such as UV-B exposure, heavy metal stress, and cold stress, increase α-dox transcript accumulation in Nicotiana longiflora, rice and Arabidopsis, respectively [14–16]. However, more work has examined whether α-DOX is involved in a plant's response to pathogens and herbivores. In Capsicum annuum transcripts of an α-DOX homolog increase during pathogen infection . In Arabidopsis thaliana and N. tabacum, the transcriptional up-regulation of α-dox is amplified when the infection results in a hypersensitive response [9, 18]. Ponce de León et al. showed that α-dox gene expression is impaired in salicylic acid (SA)-compromised plants and transgenic A. thaliana plants silenced in α-dox expression do more rapidly develop severe necrotic lesions in response to incompatible bacteria than do wild-type (WT) plants. This suggests that α-DOX1 activity protects tissues from excessive necrosis; however, the responsible mechanisms remain unknown. In N. attenuata, the effects of pathogen inoculation and treatment with pathogen-derived elicitors on N. attenuata α-dox transcript accumulation is much weaker than that of its homologues in other species . The strong transcriptional up-regulation of N. attenuataα-dox in response to herbivore attack involves the initial perception of fatty acid amino acid conjugates (FACs), which are herbivore specific elicitors in the oral secretions (OS) of lepidopteran larvae . In addition, the up-regulation of α-dox requires the JA-signaling pathway as demonstrated by the lack of α-dox transcript accumulation in OS-elicited lox3-silenced plants . JA elicitation of α-dox transcripts has also been reported in Oryza sativa  and N. tabacum . This regulation suggests an anti-herbivore function for Naα-DOX in N. attenuata. Generally, the increased transcription of α-dox genes in plants attacked by herbivores and pathogens suggests a defensive function; however, plant α-dox transcripts and activity are also regulated during developmental processes. Fatty acidα-oxidation was first reported in peanut seedlings during germination . Also during germination, one of the first α-DOX proteins was isolated in pea. Pea seedlings accumulate Psα-dox transcripts at much higher levels than do leaves and dry seeds  and these are lost during maturation  and later detected exclusively in roots. Additional evidence for a role in development is suggested by the increasing expression Ntα-dox gene during leaf senescence in N. tabacum . FA α-oxidation is phylogenetically widespread, as even preparations from green alga form 2-hydroxypalmic acid from palmic acid . The α-DOX proteins identified in different plant species show high amino acid homologies. For example, the amino acid sequence of N. tabacum α-DOX shares high amino acid similarities with the proteins in N. attenuata (95% identity), C. annuum (85% identity), Solanum lycopersicum (84% identity), A. thaliana (75% identity), and O. sativa (63% identity) . In addition to these proteins, referred to as α-DOX1, another α-DOX isoform exists. A second protein, first identified in tomato and A. thaliana, shares more homology between species than with the corresponding α-DOX1 sequence of the same species. This second protein, encoded by α-dox2, is the S. lycopersicum feebly gene, which leads to a dwarf phenotype in a knock-out mutant . The patterns of α-dox2 transcript accumulation differ from those of α-dox1 in both S. lycopersicum and A. thaliana. Whereas α-dox2 transcript accumulation is not increased by pathogen infection, it is enhanced in seedlings and in wilting leaves 3 to 6 days after detachment . Despite a similar transcriptional regulation of α-dox2 in S. lycopersicum and A. thaliana, its role in plant development appears to be species-specific. Ectopic expression of the Atα-dox2 in a tomato mutant deficient for α-dox2 partially complemented the compromised growth phenotype, but deletion of Atα-dox2 did not result in a growth phenotype . In summary, although α-DOX proteins are widespread across the plant kingdom their specific functions, presumably in defense and development, remain to be elucidated. To determine the role of the herbivore responsive α-dox1 gene in N. attenuata, we used Agrobacterium mediated plant transformation with an inverted repeat (IR) construct to silence its expression. More than half of the lines showed a severe dwarf growth phenotype, the other lines developed similarly to WT plants. Though the α-DOX activity was reduced in all lines, it was not detectable in those lines exhibiting a dwarf phenotype. To test whether this resulted from a co-silencing of a second α-dox isoform in the dwarf phenotype lines, we used a consensus sequence of α-dox2 isoforms in L. esculentum and A. thaliana to clone a gene fragment of the N. attenuata α-dox2 gene. The dwarf phenotype correlated with the co-silencing of the Naα-dox2 gene. In contrast to Naα-dox1, Naα-dox2 transcripts were not induced by wounding or simulations of Manduca sexta attack. Instead, α-dox2 was more expressed in roots and flowers. To investigate the functions of both isoforms, we transiently silenced both with gene specific constructs using virus induced gene silencing (VIGS) and examined the consequences for plant development and constitutive and induced phytohormone levels. To examine the function of Naα-dox1 [GenBank AF229926], we transformed N. attenuata with an IR construct containing a 457 bp fragment of Naα-dox1 to silence its expression (Additional file 1). Two distinct growth phenotypes were observed: 11 of the 18 independently transformed lines showed stunted growth (IR α-dox S), whereas the other lines showed a mild phenotype (IR α-dox M) and were indistinguishable from WT plants in their growth and development. Plants of the IR α-dox S lines germinate normally though a higher proportion of infertile seeds were produced by these plants. Young IR α-dox S seedlings appear similar to WT plants, but already when transplanted into soil two weeks after germination, they are slightly delayed in development. At rosette stage, approximately 35 days after germination, IR α-dox S plants are clearly delayed with rosette diameters of about a third of that of WT and IR α-dox M plants (Figure 1A). At flowering, approximately 60 days after germination, IR α-dox S plants only attained one fourth to a third of the height of WT plants and produced only few flowers (Figure 1B). Whereas WT N. attenuata plant in 1 L pots produce between 50 and 120 capsules, homozygous IR α-dox S plants usually produce between 0 and 5 capsules. The α-DOX activity was reduced in all IR α-dox lines. However, whereas IR α-dox M plants showed a reduction of around 40% in α-DOX activity, only very low or no activity was detectable in dwarf IR α-dox S plants (Figure 1C). The accumulation of the main product of α-DOX in planta: 2-HOT was reduced by more than 50% in IR α-dox M plants compared to WT and was at the detection limit in IR α-dox S plants (Figure 1D). Silencing Na α-dox1 results in lines with two different growth phenotypes correlating with the suppression level of α-DOX activity. 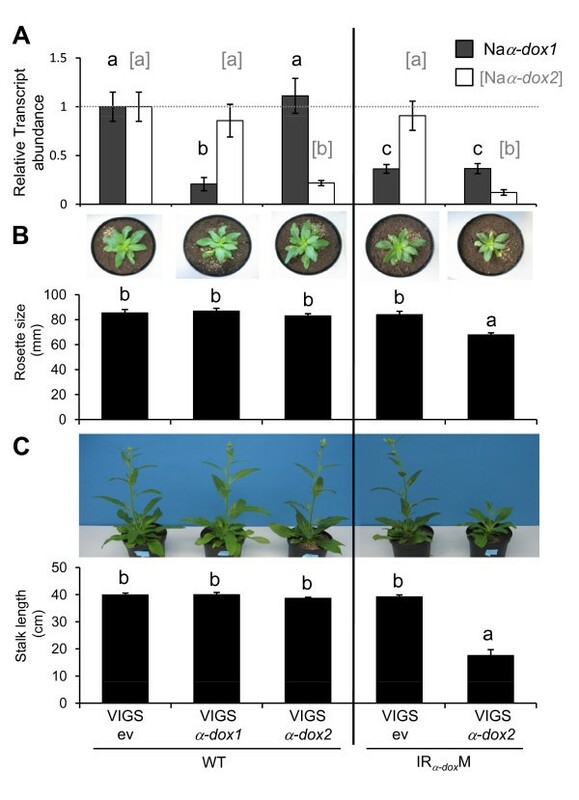 The growth phenotype of (A) 35-day-old and (B) 60-day-old WT and T3 homozygous Nicotiana attenuata plants transformed with an inverted repeat (IR) construct to silence Naα-dox1. More than half of 18 independently transformed lines are severely stunted (IR α-dox S) whereas the other lines (IR α-dox M) are morphologically indistinguishable from wild-type plants (WT). (C) α-DOX activity (mean ± SE of 4 biological replicates) of protein extracts from leaves by in vitro measurements of the formation of 8,11,14-heptadecatrienal (HDT). Leaves had been wounded and treated with 2.5 μL of OSWT every 30 min for four times. Leaves were harvested 30 min after the last treatment. (D) Leaf levels of 2-hydroxyoctadetrienoic acid (2-HOT; mean ± SE of 4 biological replicates), the main α-DOX product in planta. Asterisks signify significant differences between IR α-dox and WT plants (unpaired t-test WT vs. lines P < 0.05). nd: not detected. In S. lycopersicum and A. thaliana a second gene with high sequence similarity to α-dox1 was identified . The phenotype of tomato plants mutated at this Slα-dox2 locus (feebly, divarcata) is very similar to that of the IR α-dox S plants [26, 28]. A Southern-blot analysis performed by Hermsmeier et al. (2001) has already demonstrated that N. attenuata's genome contains at least two α-dox gene copies. We therefore investigated whether a homologue of S. lycopersicum and A. thaliana α-dox2 may also be present in N. attenuata and may have been co-silenced in the IR α-dox S plants. We used a consensus sequence of α-dox2 isoforms in S. lycopersicum and A. thaliana with low sequence identity to the N. attenuata α-dox1 gene to design primers to amplify a putative Naα-dox2 gene. We amplified a sequence and cloned it into Escherichia coli. Subsequently, a 355 bp gene fragment [GenBank EU681953.1] of the Naα-dox2 was sequenced from 3 independent clones. By comparison of this gene fragment to a custom data base of the complete N. attenuata transcriptome we identified a cDNA sequence of Naα-dox2 of 2290 bp [GenBank HM140643]. The translated amino-acid sequence deduced from this sequence clusters in a phylogenetic tree of plant α-DOX sequences close to the α-dox2 isoforms in S. lycopersicum and A. thaliana but apart from N. attenuata α-dox1 (Additional file 2). By SYBR Green-based real-time (RT)-PCR with gene specific primers for Naα-dox1 and Naα-dox2 (for primer specificity see Additional file 3A), transcript accumulation of both genes was determined in IR α-dox M and IR α-dox S plants after repeated treatment with M. sexta OS to puncture wounds, a treatment known to strongly induce Naα-dox1 transcription . Transcript accumulation of Naα-dox1 was reduced by 40% in IR α-dox M and by 85% in IR α-dox S plants of WT levels (Figure 2A). Moreover, in IR α-dox S plants transcript accumulation of Naα-dox2 transcripts was reduced by 70%, whereas IR α-dox M plants had Naα-dox2 transcript levels comparable to those of WT plants (Figure 2B). 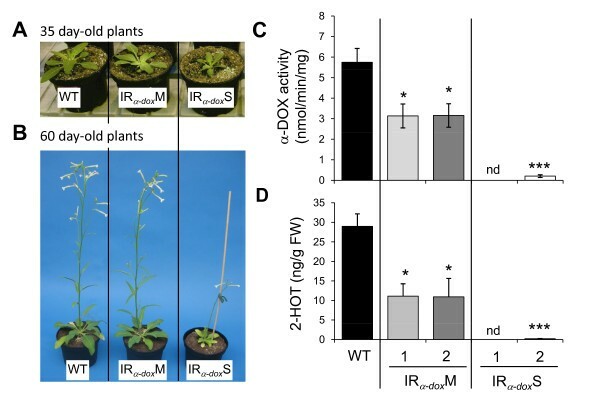 Thus, the dwarf phenotype of IR α-dox S plants is correlated with a concomitant silencing of the Naα-dox2 isoform in conjunction with a stronger silencing of the Naα-dox1 gene. The stunted growth phenotype of stably transformed IR α-dox S plants is associated with a stronger silencing of Na α-dox1 and a co-silencing of Na α-dox2. Transcript accumulation (mean ± SE of 5 biological replicates) as measured by SYBR Green-based real time-PCR of (A) Naα-dox1 and (B) Naα-dox2 in wild-type Nicotiana attenuata (WT) and plants transformed with an inverted repeat (IR) construct to silence Naα-dox1. The transcript abundance is expressed relative to WT expression. Whereas lines that are morphologically similar to WT plants (IR α-dox M) show a moderate silencing of α-dox1, severely stunted lines (IR α-dox S) are more strongly reduced in α-dox1 transcripts and co-silenced for the α-dox2 gene. Leaves had been wounded and treated with 2.5 μL of OS every 30 min for four times. Leaves were harvested 30 min after the last treatment. Asterisks signify significant differences between IR α-dox and WT plants (unpaired t-test for transcripts of Naα-dox1: M1 P = 0.04, M2 P = 0.03, S1 P = 0.001, S2 P = 0.01; of Naα-dox2: M1 P = 0.37, M2 P = 0.63, S1 P = 0.01, S2 P = 0.03). To evaluate the roles that Naα-dox1 and Naα-dox2 play during development we analyzed transcripts of both genes in various tissues of developing N. attenuata plants. Both genes show strong tissue specific differences in their transcript abundance (Figure 3A). In N. attenuata leaves, transcripts of both Naα-dox genes accumulate with plant and leaf maturation resulting in highest transcript levels in senescing leaves. In leaf tissues, Naα-dox1 transcripts are generally more abundant than Naα-dox2 transcripts. Though this difference was only significant in the young rosette leaves, the same tendency was observed in stem leaves, rosette leaves (paired t-test P = 0.053), and senescing leaves. The difference between the two Naα-dox genes was more pronounced in roots, flower buds, and flowers, but in these tissues Naα-dox2 transcripts were much more abundant than those of Naα-dox1. In brief, Naα-dox2 expression is increased in roots, during flower formation, as well as during leaf maturation and senescence, but only the latter process also enhanced Naα-dox1 transcripts. Transcriptional regulation of Na α-dox genes in development and the response to wounding and Manduca sexta oral secretions. (A) Mean ± SE (3 biological replicates) of transcript abundance of Naα-dox1 and Naα-dox2 (relative to actin transcripts) in various tissues of developing wild-type Nicotiana attenuata. Different letters signify significant differences between different tissues for transcript abundance of Naα-dox1 (in black) and Naα-dox2 (in gray and brackets) respectively (ANOVAs with factor tissue: α-dox1 F6,21 = 18.65, P < 0.0001 and α-dox2 F6,21 = 20.63, P < 0.0001; Fisher's PLDS for significant differences P < 0.036). Paired t-tests were used to test for significant differences between transcript abundance of Naα-dox1 and Naα-dox2 in the tissues (roots: P = 0.005, young rosette leaves P = 0.047, stem leaves P = 0.053, old rosette leaves P = 0.047, senescing leaves P = 0.075, flower buds P = 0.02, flowers P = 0.03). (B) Mean ± SE (5 biological replicates) of transcript abundance of Naα-dox1 and Naα-dox2 (relative to actin transcripts) in leaves from N. attenuata rosette stage plants wounded at the first fully expanded source leaf with a fabric pattern wheel every 30 min for four times. To the resulting puncture wounds 2.5 μL of either water (W) or M. sexta's oral secretions (OS) were added. Only the expression of Naα-dox1 but not that of Naα-dox2 increased after wounding, which was amplified by OS application (2 factorial ANOVA with factors treatment and time: Naα-dox1 P < 0.0046 for both factors the interaction; for Naα-dox2: P > 0.45 for both factors the interaction). As both Naα-dox genes have a similar transcriptional regulation during normal leaf maturation, the question arises, whether the Naα-dox2 is also regulated during herbivore attack as is known for the Naα-dox1 gene in the leaves of N. attenuata. Therefore, we compared the inducibility of Naα-dox1 and Naα-dox2 transcript accumulation by wounding and herbivore specific elicitors. By SYBR Green-based RT-PCR gene specific transcript accumulation of Naα-dox1 and Naα-dox2 genes was determined in WT N. attenuata plants after repeated treatment with M. sexta OS to puncture wounds. As known from previous studies [5, 30] transcript accumulation of Naα-dox1 is increased significantly by wounding and is further up-regulated by the treatment of the wounds with M. sexta OS (Figure 3B). Interestingly, the Naα-dox2 gene does not respond to wounding or to the application of M. sexta OS. We measured phytohormone levels in leaves to characterize the metabolic consequences of silencing either Naα-dox1 or additionally Naα-dox2. We quantified levels of JA, abscisic acid (ABA) and SA because previous studies indicated that α-DOX is involved in the physiological processes mediated by these phytohormones. The major signaling molecule in herbivore induced responses, JA, has been shown to be required for α-dox1 expression in N. attenuata  and levels of ABA and SA have been reported to regulate α-dox expression in Arabidopsis and tomato plants [9, 13]. The IR α-dox S plants that were co-silenced for both Naα-dox isoforms showed strongly increased levels of the phytohormone ABA, but the IR α-dox M plants did not (Additional file 4A). In 39-days old rosette stage plants, we found an almost 3-fold increase in constitutive ABA levels and a slight increase in constitutive JA levels (Additional file 4B) in IR α-dox S plants compared to WT. Similarly, constitutive levels of SA were increased in IR α-dox S plants compared to WT (Additional file 4C). Because the retarded growth phenotype of the IR α-dox S plants is already evident at the seedling stage, we also measured anthocyanins in the seedling stage. Anthocyanins are general indicators of stress responses and thought to be involved in a stress signaling response via reactive oxygen species (ROS) . In seedlings of an IR α-dox S line, levels of total anthocyanins were more than five-fold higher than WT levels 11 and 15 days after germination started (Additional file 3B). Seedlings of a second IR α-dox S line had anthocyanin levels increased by more than 10% 19 days after sowing. The increase in anthocyanins in IR α-dox S lines compared to WT seedlings was significant (Mann-Whitney U-tests P < 0.05 for 11 and 15 days old seedlings of both lines and for 19 days old seedling of one line). To disentangle the single and combined effects of Naα-dox1 and Naα-dox2 silencing we created gene-specific silencing constructs and transiently silenced Naα-dox1 and Naα-dox2 separately and in combination using VIGS and examined growth parameter. That VIGS constructs were gene specific was confirmed by real time PCR for Naα-dox1 and Naα-dox2 genes in VIGS plants (Figure 4A). To compare VIGS of Naα-dox1 with stably transformed in IR α-dox M lines and to IR α-dox S lines we inoculated in addition to WT also IR α-dox M plants with the empty vector (ev) and the VIGS construct to specifically silence Naα-dox2. 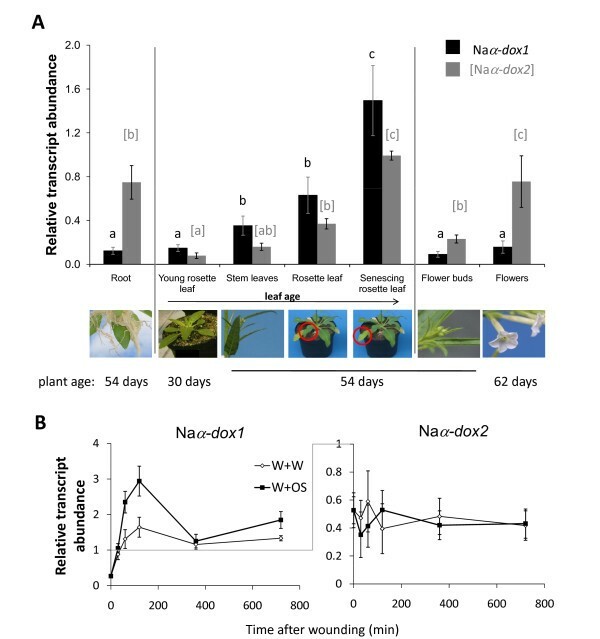 Stable and transient silencing of only Naα-dox1 as well as transient silencing of only Naα-dox2 did not affect plant growth, but the additional silencing of Naα-dox2 in a stable line silenced for Naα-dox1 resulted in stunted growth (Figure 4B, C). Thus, VIGSα-dox2 in IR α-dox M transformants resembled the growth phenotype when both genes were co-silenced in stably transformed IR α-dox S lines. Co-silencing of Na α-dox1 and Na α-dox2 reduced plant growth of Nicotiana attenuata. (A) Relative transcript abundance of Naα-dox genes (mean ± SE of 5 biological replicates) in plants subjected to virus-induced gene silencing (VIGS). Wild-type plants (WT) and plants stably silenced for Naα-dox1 using an inverted repeat (IR) construct were inoculated with VIGS constructs when 22 days old. Gene expression levels relative to empty vector controls (ev) confirm the gene specific silencing of Naα-dox1 and Naα-dox2 and was analyzed in rosette leaves by SYBR Green-based real time PCR (B) Rosette diameter of 39-days old and (C) stalk length of 60-days old plants (mean ± SE of 11 biological replicates) silenced for Naα-dox1 and Naα-dox2 by VIGS. Stable and transient silencing of only Naα-dox1 as well as transient silencing of only Naα-dox2 did not affect plant growth, but the silencing of Naα-dox2 in a stable line silenced for Naα-dox1 resulted in stunted growth. Different letters signify significant differences in growth parameters or transcript abundance of Naα-dox1 (in black) and Naα-dox2 (in gray and brackets) respectively (ANOVAs with factor transformant: for rosette diameters F4,50 = 12.81, P < 0.0001 for stem length F4,50 = 197.87, P < 0.0001; Fischer's PLSD comparisons between VIGSα-dox2 in IR α-dox M vs. all other transformants P < 0.0001, whereas for comparisons between all other transformants P > 0.21). To investigate the role of Naα-dox genes in the plant response to herbivory, we analyzed phytohormones regulating physiological processes that α-DOX has been associated with and induced nicotine accumulation in the plants transiently silenced for either Naα-dox1 or Naα-dox2 or both. Further, we accessed the contribution of Naα-dox1 and Naα-dox2 to constitutive and M. sexta-induced 2-HOT production. 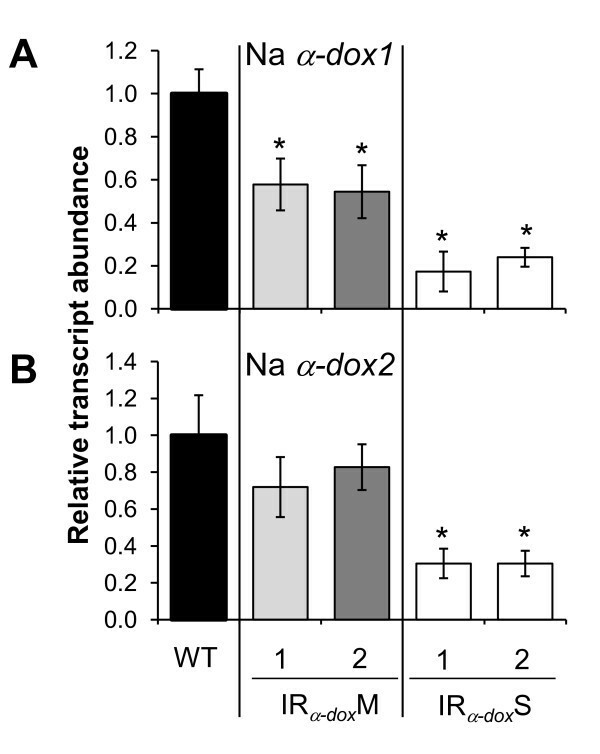 Constitutive 2-HOT levels were significantly reduced in plants silenced for Naα-dox1 or Naα-dox2 (Figure 5A) with the strongest reduction in plants silenced for both genes. Herbivory by M. sexta significantly increased 2-HOT levels. This induction was compromised in all plants silenced in Naα-dox1 (Fisher's PLSD VIGSev in WT vs. α-dox1 silenced transformants P < 0.001) but silencing only Naα-dox2 accounted for a minor reduction in herbivory-induced 2-HOT (Fisher's PLSD VIGSα-dox2 in WT vs. all transformants silenced for Naα-dox1 P < 0.004). Silencing Na α-dox1 and/or Na α-dox2 in Nicotiana attenuata differentially affects defense 2-HOT, hormone and nicotine accumulation. Mean ± SE (n = 6 induced & 5 constitutive plants) of leaf levels of (A) 2-HOT, (B) ABA, (C) A, and (D) nicotine of plants that had been fed on by Manduca sexta larvae for 4 days or left undamaged. Plants were transiently silenced for Naα-dox1 and Naα-dox2 by virus-induced gene silencing (VIGS) or transformed with an empty vector (ev). Wild-type plants (WT) and plants stably silenced for Naα-dox1 using an inverted repeat (IR) construct were inoculated with VIGS constructs when 22 days old. Larvae were applied on day 39. Two-factorial ANOVAs with factor transformant and factor M. sexta feeding revealed significant effects of (2-HOT levels: transformant F4,40 = 23.27, M. sexta F1,40 = 203.41, interaction F4,40 = 5.07, all P < 0.002; ABA levels: transformant F4,35 = 10.53, P < 0.001, M. sexta F1,35 = 8.08, P = 0.007, interaction F4,35 = 0.82, P = 0.52; JA levels: transformant F4,35 = 10.15, P < 0.0001, M. sexta F1,35 = 1058.2, P < 0.0001, interaction F4,35 = 0.41, P = 0. 80). Different letters signify significant differences according to 1-factorial ANOVAs and Fisher's PLDS at P < 0.05 (ANOVA P and F values are given in the graph). The key hormone for responses during pathogen infection salicylic acid (SA) was not significantly affected by the feeding of M. sexta but by the expression of α-DOX in the transformed lines (Additional file 4D, E). SA tended to be reduced in all α-dox silenced plants with and without herbivory by M. sexta, however, this trend was only significant for the comparison between WT plants inoculated with VIGSev and VIGSα-dox2. Feeding by M. sexta significantly increased ABA levels (Figure 5B). Constitutive and M. sexta-induced levels of ABA are significantly enhanced in plants silenced for both Naα-dox genes (Fisher's PLSD VIGSα-dox2 in IR α-dox M vs. all other transformants P < 0.001). Silencing Naα-dox1 decreases M. sexta-induced ABA levels, as ABA levels in VIGSα-dox1 plants were significantly lower compared to VIGSev WT plants and the same tendency was observed in VIGSev in IR α-dox M plants (Fisher's PLSD VIGSev in WT vs. VIGSev in IR α-dox M P = 0.06). As expected, JA levels were strongly increased in response to M. sexta feeding (Figure 5C). The levels of induced JA were lower in plants transiently and stably silenced only for Naα-dox1 compared to VIGSev WT (Fisher's PLSD VIGSev vs. VIGSα-dox1 P = 0.0007, VIGSev in WT vs. VIGSev in IR α-dox M P = 0.007), but not in those silenced for α-dox2 (Fisher's PLSD VIGSev vs. VIGSα-dox2 P = 0.32). Plants silenced for both Naα-dox genes had higher levels of JA compared to plants silenced for Naα-dox1 alone, which was already apparent in constitutive JA levels (Fisher's PLSD VIGSα-dox2 in IR α-dox M vs. other transformants P < 0.03 except vs. VIGSev WT P = 0.70) and did not result from an increased induction after M. sexta feeding. Induced nicotine accumulation in VIGS plants corresponded well with the observed JA induction pattern and was lower in the plants only silenced for Naα-dox1, but not in those silenced for Naα-dox2 (Figure 5D). However, the data with heterogeneous variances were not normally distributed and no transformation for the nicotine data allowed for parametric statistical analysis; the Mann-Whitney U-test only detected a significant difference between plants silenced for Naα-dox1 and those silenced for both Naα-dox genes (VIGSα-dox1 WT vs. VIGSα-dox2 in IR α-dox M P = 0.01) because nicotine levels were highest in the latter plants. These results indicate that the effects of individual and simultaneous silencing of the two Naα-dox genes exhibit opposing effects likely resulting from different causes. Whereas stable and transient silencing of the Naα-dox1 gene weakens the herbivore-induced plant response with respect to JA and ABA as well as secondary metabolite production, the silencing of both Naα-dox genes, which stunts growth, results in higher constitutive levels of diverse stress-related traits, some of which are likely to also be elicited by herbivore attack. The function of the α-DOX pathway, which is widespread in the plant kingdom, is poorly understood. Here we identify the Naα-dox2 gene in N. attenuata and demonstrate that α-oxidation of fatty acids plays an important role during its development and that Naα-dox1 and Naα-dox2 differ in their transcriptional regulation. Both genes are transcriptionally up-regulated during leaf maturation and senescence and silencing both genes results in retarded growth of N. attenuata plants. However, the distinct expression patterns of the two Naα-dox genes indicate a more important role of the Naα-dox2 gene during plant development, especially in root and flower development and seedling maturation. The strong transcriptional regulation of Naα-dox1 in response to herbivory and the reduced induction of JA when Naα-dox1 is silenced suggest a role in plant defense responses, whereas Naα-dox2 shows no transcriptional regulation in response to herbivory and its silencing did not change the elicitation of JA. We infer from the different patterns of transcriptional regulation that the two Naα-dox genes contribute differently to functions in primary and secondary plant metabolism in N. attenuata. We identified the Naα-dox2 gene and obtained a 2290 bp cDNA sequence from a full transcriptome data base of N. attenuata. The Naα-dox2 likely corresponds to an orthologue of Arabidopsis and tomatoα-dox genes with which they share 89% and 79% sequence homology, whereas sequence homology between Naα-dox1 and Naα-dox2 is 69%. The duplication of α-dox genes likely occurred early in the evolution of eudicots before the split of Solanaceae and Brassicaceae, since the orthologues between species contain significantly more homologies than do the paralogues within species. Stable transformation of N. attenuata plants with a silencing construct for Naα-dox1 resulted in two distinct growth phenotypes. Whereas growth and development of IR α-dox M lines with a ca. 40% reduction of α-DOX activity were indistinguishable from those of WT plants, about 60% of the generated lines with low or undetectable α-DOX activity were highly stunted (IR α-dox S). Stable transformations were performed before the α-dox2 paralogues were known and gene specific real time PCR revealed that these two phenotypes correlated with a dissimilar silencing of Naα-dox1 and Naα-dox2 in the respective lines. Whereas IR α-dox M plants are reduced in Naα-dox1 transcript accumulation by 40%, they are not significantly altered in Naα-dox2 transcript accumulation. IR α-dox S lines, on the other hand, are reduced by 85% in Naα-dox1 and 70% in Naα-dox2 transcript accumulation. The Naα-dox1 silencing construct shares 72% sequence similarity with the Naα-dox2 gene and contains a 24 nucleotide match with only one mismatch, which was probably sufficient for the co-silencing of both Naα-dox genes in the majority of transformed lines. The stunted growth could either result from a concomitant silencing of both Naα-dox genes or the loss of the Naα-dox2 function alone. The latter hypothesis is consistent with the stunted growth phenotype of feebly  and divaricata mutants  in tomato, which result from insertional mutagenesis at the locus of the Slα-dox2 homologue. However, Arabidopsis mutants of Atα-dox2 do not show any developmental abnormalities, indicating that the developmental role of α-dox2 may be restricted to a specific clade e.g. Solanaceae. Alternatively, α-dox functions in N. attenuata may also be distinct from those in tomato, and the stunted growth of in IR α-dox S lines is the consequence of an almost complete loss of total α-DOX activity due to a silencing of both Naα-dox genes. By using VIGS-constructs specific for Naα-dox1 and Naα-dox2 we recognized that silencing Naα-dox1 and Naα-dox2 individually did not affect growth, but silencing both genes concomitantly decreased plant growth. This finding is consistent with the hypothesis that the stunted growth phenotype results from a reduction in total α-DOX activity and indicates that the α-oxidation activity of the enzymes of both genes can compensate for the loss of function of the other. With in vitro assays, Bannenberg et al. demonstrated that tomato Slα-dox1 and Slα-dox2 have a similar range of fatty acid substrates and activities. In N. attenuata both Naα-dox genes can function in plant development, whereas in tomato the loss of Slα-dox2 function is sufficient to stunt growth and in Arabidopsis the loss of both Atα-dox genes does not affect growth . The normal growth of N. attenuata plants silenced for Naα-dox2 by VIGS may alternatively be explained by a lower silencing efficiency compared to the Slα-dox2 tomato insertional mutant, however this seems unlikely given that VIGS reduced Naα-dox2 transcripts by 80% and silencing by stable transformation only reduced transcript levels by 70% in the dwarf IR α-dox S plants. That the stunted growth in stably transformed IR α-dox S lines is more pronounced than in the VIGS plants co-silenced for Naα-dox1 and Naα-dox2 is probably due to greater effects of silencing a gene early than later in development. The growth of IR α-dox S plants was already delayed two weeks after germination. Though we did not observe obvious growth differences between WT and IR α-dox S seedlings, the importance of α-DOX activity during seedling maturation in N. attenuata is supported by highly increased levels of anthocyanins in IR α-dox S seedlings. Increased levels of anthocyanins are also described for tomato mutants lacking Slα-dox2 function . The importance of α-oxidation of fatty acids during germination processes is also suggested by the increased transcript accumulation and enzymatic activity of a Psα-dox during the first days of germinating pea plants . Increased levels of anthocyanins and ABA are often associated with oxidative stress  and levels of ABA are also increased in IR α-dox S plants. Additionally, constitutive levels of the phytohormones JA and SA are increased in IR α-dox S plants. Thus, strong silencing of both Naα-dox genes in IR α-dox S plants could have led to severe physiological stress resulting in increased levels of several stress-related metabolites such as several phytohormones. Alternatively, higher levels of constitutive phytohormones could be a consequence of less cellular expansion in these lines, rather than specific effects on specific metabolic pathways. None of these changes were observed in IR α-dox M plants indicating that a moderate silencing of Naα-dox1 does not result in comparable physiological stress during development. Transcript accumulation of Naα-dox1 and Naα-dox2 in various tissues of developing N. attenuata plants were determined to characterize their endogenous roles. In roots, transcript accumulation of Naα-dox2 is very high, whereas it is very low for Naα-dox1, which is consistent with previous studies in N. attenuata  that found no Naα-dox1 expression in roots. The root specific expression of Naα-dox2 distinguishes N. attenuata from pea, Arabidopsis and tomato, in which α-dox1 is expressed in roots but not α-dox2. Bannenberg et al. found no detectable Atα-dox2 transcripts in roots of Arabidopsis and only very low levels of Slα-dox2 transcripts but high levels of one Slα-dox1 isoform in tomato roots. In Arabidopsis, the Atα-dox1 promoter is exclusively active in roots whereas the Atα-dox2 promoter is exclusively active in shoots [19, 28, 34]. In pea seedlings, Psα-dox is almost exclusively expressed in roots and this gene shares a greater degree of amino acid sequence similarity with Ntα-dox1 and Atα-dox1 than with Atα-dox2 . In this regard, the stunted phenotype of IR α-dox S lines could also result from silencing Naα-dox2, which may have interfered with root development causing the observed growth and stress responses. IR α-dox S lines are characterized by a small main root and very few lateral roots; to determine whether this is a cause or a consequence of the dwarf growth, grafting experiments would be required. However, the loss of function of Naα-dox2 in root development can only contribute to but not cause the dwarf phenotype, as the silencing of both Naα-dox genes is required to stunt growth. In N. attenuata, the transcripts of both Naα-dox genes accumulate during leaf maturation and natural senescence with levels of Naα-dox1 exceeding those of Naα-dox2. This is in contrast to tomato and Arabidopsis, in which Atα-dox2 and Slα-dox2 transcripts only accumulate in response to the artificial senescence stimulus of leaf detachment [27, 28], whereas neither α-dox1 nor α-dox2 genes accumulate in leaves attached to plants. Moreover, in contrast to N. attenuata, in which the levels of Naα-dox1 transcripts exceed those of Naα-dox2, in Arabidopsis and tomato Atα-dox1 and Slα-dox1 transcripts are barely detected in leaves and showed only an extremely weak response to leaf detachment. However, the results in N. attenuata are in line with the increasing expression of Naα-dox1 gene during natural leaf senescence in N. tabacum . We propose that in Nicotiana species α-dox genes may be involved in the regulation of senescence, whereas in Arabidopsis and tomato increasing oxidative stress in the dying tissue of a detached leaf may be at work. The loss of function of both Naα-dox genes during leaf maturation may be involved in the dwarf phenotype of the IR α-dox S lines as the overlapping transcriptional regulation of Naα-dox1 and Naα-dox2 in leaves corresponds well to the observation that silencing of both genes is necessary to stunt growth. During flower maturation in N. attenuata, only Naα-dox2 transcripts accumulate, so that they are twofold higher in mature flowers than in flower buds. Consistent with Hermsmeier et al. , who found no transcripts of Naα-dox1 in flowers of N. attenuata, we found very low transcript abundance of Naα-dox1 in flowers. However, in Arabidopsis, promoters of both Atα-dox genes are active in anthers and the Atα-dox2 promoter was additionally shown to be active in the ovaries and siliques [19, 28]. In distylous species of Turnera, a homologue of α-dox1 is specifically expressed in short-styled plants . Interestingly, long chain aldehydes, similar to those generated in vitro by the activity of α-DOX proteins, are emitted by many flowers ; however, the role of α-dox genes during flower maturation remains unknown and is likely not involved in causing the stunted phenotype. The similar regulation of the two Naα-dox genes in N. attenuata leaves is restricted to developmental regulation, however in contrast to Naα-dox1, the Naα-dox2 gene does not respond to wounding or the elicitors in the OS of M. sexta larvae. In agreement with its up-regulation during herbivory, Naα-dox1 contributed most to the herbivore-inducible 2-HOT level. Silencing of Naα-dox1 by VIGS or stable transformation reduced herbivore-inducible 2-HOT levels by 60% while silencing only Naα-dox2 had only a marginal effect. Accordingly, we found no effect of silencing Naα-dox2 by VIGS on induced responses to M. sexta herbivory, whereas stable and transient silencing of Naα-dox1 decreased the M. sexta-induced levels of JA by 30% and tended to decrease induced levels of the direct defense metabolite, nicotine. VIGS of Naα-dox1 also reduced M. sexta-induced ABA levels by 25%. Thus, Naα-dox1 plays an important role in the regulation of the plant's response to herbivory, whereas silencing Naα-dox2 did not affect induced phytohormone levels. VIGS of both Naα-dox genes concomitantly only increased constitutive levels of JA and ABA and strongly decreased constitutive levels of 2-HOT which is consistent with the phytohormone phenotype in stably transformed plants co-silenced for Naα-dox1 and Naα-dox2. Because plants silenced for both Naα-dox genes display the loss of function in development and in the plant's response to herbivory, the specific role of Naα-dox1 during herbivory should be further investigated using IR α-dox M plants and plants silenced by VIGS for Naα-dox1. A kinetic analysis of JA induction in the Naα-dox1 silenced plants may reveal potential feedback regulation by 2-HOT, as we show here that Naα-dox1 gene expression is mediated by but also affects JA signaling. In this study we identified the α-dox2 isoform in N. attenuata and revealed that both Naα-dox genes function in development but that only Naα-dox1 functions in anti-herbivore defense. The conditions that regulate the two α-dox isoforms and the consequences of their loss of function in N. attenuata and other plants share commonalities and clear differences supporting quite divergent functions in different plant species. Interestingly, phylogenetic relation is a poor predictor of the regulation of α-dox genes in different plant species (see Additional file 5 for a summary of the putative functions in a phylogenetic context), but transcriptional regulation is suggested to determine function of α-dox genes, because the enzymatic activity is largely similar for the α-dox paralogues within species as well as for the orthologes among species. This suggests that the α-DOX pathway is a relatively plastic metabolic route in plant primary metabolism which became repeatedly co-opted for specialized functions associated with adaptation to environmental stress. A better mechanistic understanding of the role of α-dox genes during plant development and stress responses will help to explain the differences and seemingly convergent similarities of α-dox regulation in different plant species. We used inbred lines of Nicotiana attenuata Torr. ex Watson derived from field-collected seeds (Baldwin, 1998) for transformation and all experiments. Seed germination and Agrobacterium tumefaciens (strain LBA 4404)-mediated transformation procedure are described in Krügel et al. . All plants were grown in the glasshouse in 1 L pots at 26-28°C under 16 h of light supplied by Philips Sun-T Agro 400- or 600-W sodium lights. To silence the expression of the N. attenuata α-dox1 gene [GenBank AF229926], a 458 bp fragment  was cloned twice in an inverted-repeat orientation into a pRESC5 transformation vector. T1 plants were screened for resistance to hygromycin (hygromycin phosphotransferase II gene from pCAMBIA-1301 [GenBank AF234297] contained in the pRESC5 vector). Homozygosity was determined by resistance screening of the T2 plants. Flow cytometric analysis described by Bubner et al. revealed that all the lines were diploid. Each transformed line harbored only a single insertion, as determined by Southern blot analysis (Additional file 3C) performed on EcoRV-digested genomic DNA with a probe specific for the selective marker gene hygromycin phosphotransferaseII (plasmids used for transformation were included as a positive control and additionally digested with XhoI). For the experiments we used two IR α-dox S lines (line 1: A03-77; line 2: A03-137) with stunted and two IR α-dox M lines with normal growth (line 1: A03-282; line 2: A03-75), whereas IR α-dox M line 2 was used in the VIGS experiment. For virus induced gene silencing, PCR amplified fragments of Naα-dox1 and Naα-dox2 (each fragment was 187 bp long, for specific sequence see Additional file 1) were digested with BamHI and SalI and each cloned into the pTV00 vector digested with the same restriction enzymes. The pTV00 vector is a 5.5-kb plasmid with an origin of replication for Escherichia coli and A. tumefaciens and a gene for kanamycin resistance (Ratcliff et al., 2001). Early rosette-stage plants (3 weeks old) were pressure-injected with A. tumefaciens (strain GV3101) harboring either the pTVα-dox1, pTVα-dox2 or the empty vector (ev) control pTV00. A phytoene desaturase-silencing construct (pTVpds) that causes photobleaching was used as a visible positive control for the VIGS process in all experiments. Inoculation and constructs are described in Saedler and Baldwin . When the leaves of phytoene desaturase-silenced plants began to bleach (17 days after inoculation) leaves of α-dox-silenced and ev-inoculated plants were used. Experiments with stable transformants were performed with T3 generation IR α-dox plants. Analysis of induced responses (phytohormones, α-DOX activity, and transcriptional changes) was performed with four to five week-old (rosette-stage) plants and treatments were randomly assigned. To mimic herbivory, the first fully expanded source leaf was wounded four times with a fabric pattern wheel with a row of puncture wounds on each side of the midrib and each row received 5 μL of a 1:1 v/v dilution of the oral secretions of M. sexta. At specified time points, leaves were excised, immediately frozen in liquid nitrogen, and stored at -80°C until use. Naα-dox1 and Naα-dox2 constitutive transcript abundances were measured in different tissue parts from WT N. attenuata plants. The entire young rosette-stage plant was harvested 30 days after germination. Roots, green or senescing yellow rosette leaves, stem leaves (S5-S8) and flower buds were harvested from 54-day old plants. Complete flowers were harvested 62 days after germination. Plants that had been subject to virus-induced gene silencing were measured for rosette diameter 17 days after inoculation (at which time there were no differences in plant size) and for stalk elongation 38 days after inoculation. Half of the plants received a M. sexta neonate on the transition leaf after inoculation and these larvae were allowed to feed for 4 days. On day 4, leaves on which neonates were feeding were harvested for metabolite measurements. Eggs of M. sexta were from North Carolina State University (Raleigh, NC, USA) and maintained in a growth chamber (Snijders Scientific, Tilburg, Netherlands) at 26°C 16 h light, 24°C 8 h darkness until the larvae hatched. Primers were designed according to a consensus sequence of α-dox2 isoforms in S. lycopersicum and A. thaliana which have a low sequence identity to the Naα-dox1 gene. The resulting PCR amplicon was cloned into pGEM-T Easy plasmid (Promega), transformed into Escherichia coli competent cells (JM109) and subsequently sequenced on a Genetic Analyzer 3100 (Applied Biosystems, Darmstadt, Germany) from 3 independent clones. The resulting 355 bp gene fragment of the Naα-dox2 was compared to a data base of the complete transcriptome of N. attenuata (VERTIS Biotechnologie AG, Germany) and a 2290 bp cDNA sequence of the Naα-dox2 gene was identified. Total RNA was extracted with trizol following the TIGR protocol available under http://www.jcvi.org/potato/sol_ma_protocols.shtml and cDNA was synthesized from 150 ng RNA using MultiScribe™ reverse transcriptase (Applied Biosystems, Darmstadt, Germany). Quantitative real time PCR (ABI PRISM™ 7000; Applied Biosystems) was conducted using the quantitative PCR™ core reagent kit (Eurogentec, Seraing, Belgium) and gene specific primers for SYBR Green-based quantitative PCR (Naα-dox1 forward primer: GTGTTGCTAGGTACAATGAA TTTC; Naα-dox1 reverse primer: CAACCATCAGATCCAATTCTTCT; Naα-dox2 forward primer: GTTCCACGGTACAACGAGTTCA; Naα-dox2 reverse primer: AACTTGGAGATCTAGCTTCTCA). PCR conditions were used according to the manufacturer's recommendations. For each treatment/line combination cDNA of 3 biological replicates were repeated with 3 technical replicates. Relative expression levels were calculated according to a linear standard curve of the threshold cycle number regressed against the log concentration of a dilution series of cDNA standards that were analyzed on each 96-well plate. The expression of actin [GenBank EU273278.1] was used as an internal reference to normalize cDNA concentrations. Leaves (pooled from 5 plants) were crushed in liquid nitrogen and 250 μL extraction buffer (0.1 M Tris-HCl pH 7.5) were used for every 100 mg tissue. Leaf tissues were subsequently completely homogenized by being vortexed at 4°C for 45 min. After centrifugation, protein concentration of the resulting supernatants was measured using a Bio-Rad protein assay kit with bovine serum albumin (BSA) as a standard. The α-DOX activity was assayed indirectly by measuring HDT formation in response to α-linolenic acid (C18:3) incubation. The reaction mixture consisted of 200 μM C18:3 incubated with 200 μL of protein solution and Tris-HCl buffer (0.1 M, pH 7.5) in a total volume of 500 μL. α-DOX products and the residual C18:3 were extracted with ethyl acetate; HDT was quantified by reverse-phase HPLC-UV after 2,4-dinitrophenylhydrazine derivatization, following the established procedure described in Kohlmann et al. .
Nicotine was analyzed by HPLC as described previously (Keinanen et al., 2001) with the following modification of the extraction procedure: approximately 100 mg of frozen tissue was homogenized in 1 mL of extraction buffer using the FastPrep extraction system (Savant Instruments, NY, USA). Samples were homogenized in FastPrep tubes containing 900 mg of lysing matrix (BIO 101) by shaking at 6.0 m/s for 45 s.
To analyze phytohormones and 2-hydroxy-octadecatrienoic acid (2-HOT), 200 mg leaf samples were extracted with ethyl acetate containing 40 ng/ml D6-ABA, D4-SA and JA-13C6-Ile and 200 ng/ml of D2-JA according to Wu et al. . A 10 μl aliquot of the resulting extracts was analyzed by reverse-phase HPLC coupled to tandem mass spectrometry (HPLC/ESI-MS/MS). Phytohormones were separated from extracts at a flow rate of 100 μL min-1 on a Pursuit C8 column (3 μm, 150 × 2 mm; Varian) using a binary solvent system (A: 0.05% v/v formic acid in deionized water; B: 0.05% v/v formic acid in methanol) in gradient mode. Multiple reaction monitoring (MRM) was conducted on a 1200 L MS/MS system (Varian, Palo Alto, CA, USA), operated in negative ionization mode. Parent-ion/daughter-ion selections and collision energies were set as follows: 213/59 (D2-dihydro-JA, 12V), 209/59 (JA, 12V), 328/136 (13C6-JA-Ile, 19V), 322/130 (JA-Ile, 19V), 269/159 (D6-ABA, 9V), 263/153 (ABA, 9V), 141/97 (D4-SA, 15V), 137/93 (SA, 15V) and 293/191 (2-HOT). The area beneath the MRM product ion peak was determined for each analyte and internal standard (IS). The quantity of the analyte was calculated according to the formula: analyte product ion peak area × (IS concentration/IS product ion peak area). A calibration curve obtained by the extraction and analysis of a pool leaf sample spiked with increasing of amounts 2-HOT (Larodan Fine Chemicals, Sweden) was used for 2-HOT quantification. For anthocyanin measurements 11, 15 and 19 days old seedlings of WT and two IR α-dox S lines were extracted according to Rabino and Mancinelli . Approximately 30 seedlings (100 mg) were harvested, immediately frozen in liquid nitrogen and stored at -80°C for at least 20 minutes. After grinding 200 μl of 1% HCl/methanol solution were added and incubated overnight (15 h) at room temperature with constant vortexing. After centrifugation (5000 g, 5 min) the absorbance of the supernatant and a dilution series of cyanidin-5-O-glucoside at 530 nm and 657 nm was determined. The amount of anthocyanin was calculated according to the absorbance difference (530 nm - 657 nm). Data were analyzed using the statistic program StatView® 5.0 (SAS Institute Inc., Cary, NC, USA). All data were checked graphically for normal distribution and for variance homogeneity using the F-test and transformed if required to meet these assumptions. The general level of significance applied was α = 0.05. The effects of Naα-dox silencing on α-DOX activity, Naα-dox1 and Naα-dox2 transcript accumulation, and levels of ABA and JA in leaves were determined by comparing transformed lines against the WT N. attenuata by unpaired t-tests. Data for transcript accumulation were cube-root transformed for normality and variance homogeneity. Because no transformation was found to meet the requirements for parametric statistical analyses, levels of anthocyanins were compared between WT and IR α-dox S lines by Mann-Whitney U-tests. The tissue-specific expression was compared between the different tissues by individual 1-factorial ANOVAs followed by Fisher's PLSD for Naα-dox1 and the Naα-dox2 gene. The transcript accumulation of Naα-dox1 and Naα-dox2 in each tissue was compared by unpaired t-tests. Data were cube root-transformed for normality and variance homogeneity. The growth parameter and transcript accumulation of Naα-dox1 and Naα-dox2 for the plants silenced by VIGS were compared for statistically significant differences between transformants by 1-factorial ANOVA followed by Fisher's PLSD for individual comparisons. Growth data were box cox-transformed (λ = 1 for rosette diameters and λ = 2 for stem length) and transcript data were cube root-transformed for normality and variance homogeneity. The leaf levels of phytohormones of control and M. sexta induced VIGS plants were compared for statistically significant differences by 2-factorial ANOVA with the factors induction (2 groups: control, M. sexta feeding) and silencing (5 groups: VIGSev WT, VIGSα-dox1 WT, VIGSα-dox2 WT, VIGSev in IR α-dox M, VIGSα-dox2 in IR α-dox M) followed by Fisher's PLSD. Additionally, levels of JA, SA and ABA were analyzed by 1-factorial ANOVAs for constitutive and M. sexta induced plants separately. Data for JA and SA were log-transformed and data for ABA were cube root-transformed for normality and variance homogeneity. Because no transformation was found to meet parametric assumptions, levels of nicotine in VIGS plants were compared for significant differences between transformants by Mann-Whitney U-tests. Anke Steppuhn, Emmanuel Gaquerel contributed equally to this work. This research was supported by the Max Planck Society. We thank Dr. K. Gase for vector construction, M. Maccani for anthocyanin measurement and both for helping to clone the Naα-dox2 gene fragment. AS carried out the screening of stably transformed lines, participated in the identification of the Naα-dox2 gene, VIGS experiments, the metabolite analyses, performed the statistical analysis and participated in drafting the manuscript. EG performed the transcriptional analysis, participated in the identification of the Naα-dox2 gene, VIGS experiments, metabolite analyses, carried out the sequence alignment and participated in drafting the manuscript. ITB conceived the study and participated in its design and coordination and helped to draft the manuscript. All authors read and approved the final manuscript.